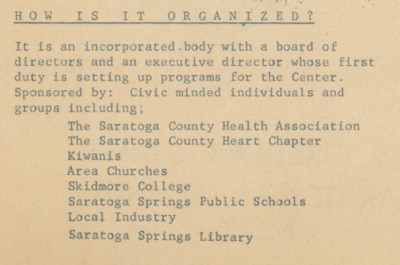 From the early years, the Center had a board of directors for strategic planning and fundraising (12-21 members) and an executive director who manages the Center’s activities and seniors’ engagement. Influential leaders include Ms. Edna Hogan, president of the Golden Age Club, and Margaret Hays (1962), the Center’s first secretary and later president of the Board of Directors. 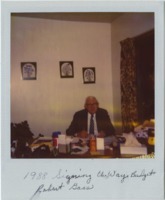 Claude van Wie, Saraoga Springs’ superintendent of schools and the board’s first president, organized the purchase of the Circular Street property, and Robert Gass (1976-1988), supervised the move to a new home (which now bears his name). 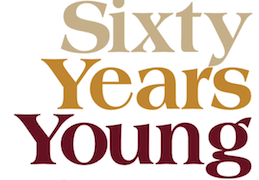 In 1961, Marjorie Vokes was hired as the Center’s first paid executive director, a job she held until 1970. Under her leadership, membership tripled from around 100 to over 300 seniors, and around three dozen used the Center every day. Over the years, a half-dozen women, notably Sylvia Newcomb (1981-2002) and one man, Bill Daniel (2002-2010), have followed in her footsteps. Lois Celeste (hired in 2010) is the active and engaged current director, under whose able and energizing leadership upgrades in infrastructure and additions have revitalized the center and its community partnerships. Staff and volunteers also serve the seniors, welcoming people to the Center, organizing events, handling correspondence, promoting activities, keeping the lights on, the kitchen clean, and the snow shoveled. Their dedication helps raise spirits and energy levels. Today’s team includes Colleen Kelley, Special Events & Program Coordinator, advocates Lisa Higgins and Janice Reada, Traci Jersen in marketing, Johann Miller for finances and facilities, Nicole Buck in the Business Center, and Kris Wurl and Karen Armstrong, who coordinate volunteers and trips, respectively, and Michelle Hicks at the front desk.